Thoughts. Files. Papers. Time. Space. The words sound nearly philosophical, but in academic research, they all play a role. Beyond that, they are how we communicate past the superficial in a culture of sound bytes and 1-minute video clips. Keeping such key areas organized is what Richard Harris and Jamie Coch (pictured above, right), co-founders of Builder® Research Paper Edition from Mead® (that’s right, that big school supply company) had in mind when they created a better way to construct knowledge (as in, writing the ol’ “research paper”). Richard and Jamie knew they were on to a way to help students learn how to learn, and they knew from their own experience that there must be a simpler way. They were right—because they made it so. In fact, to set about doing academic research—let alone simplifying it—takes a special kind of person. Here Jamie and Richard reveal a bit of who they are through their unserious approach to serious work—and show that there can be real joy in learning. Warning: Guaranteed you’ll laugh out loud in parts. Proceed with caution. Victor: Why did you create Builder Research Paper Edition from Mead? Jamie: For over 100 years, organizing thoughts, files, papers, time and space has been at the core of what our company and the Mead brand has provided to its consumers. Giving people the right tools to plan, learn and create is inherent in everything we do. No place is this more evident than in a classroom. The way students do their work will continue to evolve as students use new technologies and tools that go beyond the use of paper. Richard: So given our company’s history and tradition, the research paper seemed to be a logical place to start. It’s an important assignment, one that is traditionally painful for both the student and teacher, and an area where there aren’t a lot of good tools. There certainly aren’t many tools that leverage technology to help facilitate the process. It just seemed to make sense on a lot of different levels. Jamie: The idea of coming up with something to help students learn how to learn was also something that was very appealing. Richard: Builder Research Paper Edition from Mead is the first user friendly all-encompassing software program to help students plan, organize and write better research papers. It’s a reusable software program that will help students think critically about the process of research and writing. It is an easy to use, step by step guide that runs on a USB flash drive. The software program is delivered on the flash drive to maximize portability. This feature allows a student to work on the paper at home, school or library. 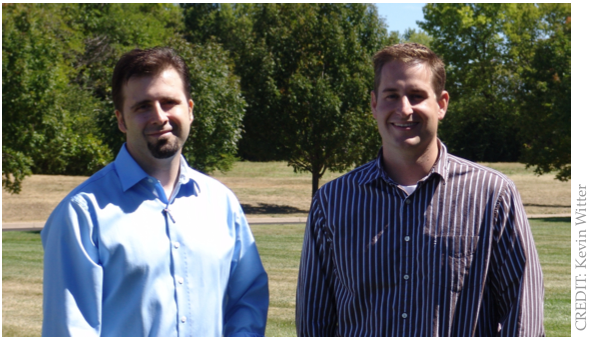 Jamie: The Builder program was created and led by myself and Richard out of our office in Kettering, Ohio. Richard: The four members of our team primarily responsible for the program as it is today, and the ones on the patent application, are: me, Jamie Coch, Asger Ottar Alstrup, and Josh Murphy. Jamie: The idea behind the Builder name is pretty simple: we want to convey the idea that we are here to help students and teachers construct knowledge. We want to simplify learning. Victor: So does that mean there will be other “Editions” in the Builder portfolio? Richard: That’s the plan. After you try out the Research Paper Edition in its current level, you can quickly start to think about other ways to help students and teachers in this manner. It’s pretty exciting. Victor: What exactly does it do? What are the main benefits? Jamie: What we’ve found is that there is an overemphasis on the steps and process of writing research. The student often becomes overwhelmed and is then unable to adapt the guidelines to fit his or her own specific paper. If it’s the first paper, the process is new along with the subject matter. Very quickly, things move from being a little crazy to completely overwhelming for the student. By leveraging technology, we have attempted to move the complexity of the standards and formatting requirements of the process into the background. The purpose is to allow the student to focus on what really matters—finding joy in learning more about a topic they actually care about. Helping students learn more about a topic and helping them communicate their ideas to others. That is something worthy of a student’s attention. We believe the technical requirements assigned to the process of writing research become obstacles to true learning. In a sense, we’ve created a tool to help a student learn how to learn something new which is pretty valuable skill given the speed in which technology and our world is progressing and changing. Richard: The step-by-step process eases students’ frustration level by giving them a schedule, automatically organizing information uniquely for each step, and eliminating duplication of work. It removes the tedium of tasks like filling-out note cards by hand and re-writing notes and topics into an outline, or piecing various independent digital resources together—the software integrates the various steps of writing a research paper into one easy-to-use tool. It’s comprehensive and designed to reinforce the instruction the student is receiving in the classroom. It’s like having an interactive tutor to work with students individually. Jamie: There are some other products that attempt to stay with the student throughout the entire process or do a specific step really well, but none of them come close to the kind of user experience a student has while working through the process of using the Builder program. Richard is always preaching that “…Being tech savvy shouldn’t be a requirement for using technology…” That’s something the Builder software does really well, it takes a very complicated project and through sophisticated technology breaks down the process into simple digestible steps. The interface is virtually invisible and self evident. You just sit down and start to use it. There is no need to read an 85 page user manual or go through an extensive training workshop before you use the program. Victor: So you guys are pretty confident? Richard: Yes, but our confidence comes from watching the student’s confidence grow as he or she uses the software. We have first hand experience using the program with students and teachers and watching the benefits and learning as it occurs. We also understand and know that the program will never be “perfect,” but that doesn’t keep us from trying. That’s why real world feedback is so important to us. We are continually committed to understanding our users needs and expectations and making adjustments and improvements. It’s our way of figuring out how we can make the program better. Victor: When was it developed or Where did it originate? What is something interesting or relevant about its development history? Jamie: The program really took shape during the summer of 2009. That’s when we had a really detailed schematic of the program that we shared with a broad group of teachers. It was a group of teachers that taught students as young as 6th grade all the way through college. Their reaction and enthusiasm told us that we were definitely on to something. Richard: Something interesting about the development history? Hmm…The initial solution for the term paper problem was actually a paper based kit. Lots of custom forms, folders and cards. Jamie: Yeah…that was a terrible idea. Richard: True, but it forced us to focus on and address the real pain points of the assignment—such as, organization of information, duplication of work and/or seemingly redundant tasks. (Hint: reasons why nobody does a research paper the way they were taught.) We needed to research, research problems, and define what problems to tackle. We engaged in extensive conversations over the course of a year with students and educators to get to the root of their issues. One quick realization was that writing a paper properly using traditional paper based tools was just too inefficient. We didn’t necessarily set out to create a digital or software solution to address these pain points; software just happened to be the best way to address these problems. Victor: Where can you get it now, What are the options? Jamie: If you are a parent or student, you can purchase the program directly. Parents or students can purchase Builder software on their own as a necessary school supply/tool for class – similar to a calculator or workbook. If you are a school, you can purchase the program for your students or by contacting our customer service team (866-947-5608). A school can purchase the Builder software and supply, sell or loan to students, similar to text or library books. The cost can be absorbed by the school or passed on to students via class fees or one-time purchase. Victor: How much does it cost? What do you get with the purchase? Richard: It’s for sale at an introductory price of $39.95. Right now the software is delivered permanently installed on a partitioned 2GB SanDisk USB drive. The program is quite small and only takes up about 15-20 MB of the drive space, so the rest of the space on the USB is for user storage. Once you buy the program, you own it for life. You can write thousands of papers if you choose to over the life of the drive. Software upgrades are also included with the $39.95 purchase price and are delivered over the web via a built-in updater. Jamie: I would encourage people that are interested to check out our website for more information. There you can read a case study from one of our schools in Knoxville or probably more importantly, check out the online demo and watch videos of the real students, teachers, principals and librarians that worked with us throughout the development of the program in the stories section of the website. Jamie Coch: I still laugh every time I think about some of those comments. We should probably get to work on the bumper stickers and t-shirts. Richard: The program is potentially helpful to anyone who needs to write a research paper. The process of researching and writing is basically the same regardless of grade or academic level, the only real difference is the sophistication of the argument. This particular version of the program, the voice and instruction, was designed with the Jr. High-High School student in mind. Jamie: It also seems to really resonate with early 4-year and community college students as well. Victor: What sort of formative experiences in your own education helped to inform your approach to creating mead builder research paper edition? Jamie: The last thing teachers need (especially now) is another person talking about poor performance, how bad of a job, failing schools… blah… blah… blah. We feel that teachers and schools need help. Help figuring out ways to simplify the learning process and engaging students in ways that help them build useful and meaningful knowledge. Richard: We find these types of conversations are best held over a pint. Neither one of us is in the classroom everyday, but I think it’s important to note that we are definitely knowledgeable and humble enough to know that educating kids is extremely difficult. There are so many variables and factors that play a role in the success of a student and school. From my experience, confidence is a big deal. I believe confidence ultimately empowers the student to take ownership of their own learning. That responsibility of ownership will get them to the necessary academic performance level. I believe the Builder software is a tool that can help them build confidence and accomplish their goals. Jamie: I’m heavily influenced by the people I met, readings and discussions experienced during the completion of my M.A. in Learning Technology at Pepperdine University. The program really challenged me to think about learning differently and how technology can play a role to facilitate learning. It allowed me the opportunity to connect with a lot of top notch educators and innovators. A big concern of mine—especially as a parent of two boys, the oldest just a year or two from Kindergarten—is looking at what our schools are preparing our kids to do. There’s an old quote from John Dewey that I really like, “With the advent of democracy and modern industrial conditions, it is impossible to foretell definitely just what civilization will be twenty years from now. Hence it is impossible to prepare the child for any precise set of conditions” (Dewey 1897). This seems like a quote from today, but it is actually from back in 1897. While the amount of change Dewey witnessed in his lifetime was significant, technology and globalization makes this quote even more relevant today. Teaching critical thinking, communication and creativity is essential if we expect students to be successful in today’s and tomorrow’s world. Richard: Look out—he’s on a roll. It’s best to just let him finish. Jamie: Technology for the sake of technology is neither a solution nor a vision. It is not a “cure all” and should only be considered once clear, meaningful learning objectives have been put in place. For me, it comes down to helping students think and interact in society. Helping students with the ability to frame and define problems as well as the means to solve those problems within his or her own environment. To be able to think and do this effectively and logically within the community are signs of an educated individual. The value of technology comes in its ability to bring speed and efficiency to learning and to projects. It can help students do things better and faster and can allow for deeper understanding and things to happen that would otherwise not be possible. Okay—I’m off my soapbox. Victor: How does Mead Builder Research Paper Edition address some of your concerns about education? Jamie: The Builder software eliminates the “process pains” that are typically associated with the current approach and steps associated with writing and organizing research papers. Doing so allows the learner and instructors to focus more on voice, argument and tone. The product is about effectively presenting and researching ideas and thoughts. Our intent is to remove the barriers of process and rules so as to better balance and facilitate curiosity and creativity as part of the assignment. Research should be about discovery and learning something new—not about whether or not I remember to italicize or underline a book title or fulfill a minimum page requirement. Richard: It gets the student engaged right away by giving them some quick successes in the first couple of steps. The early successes really help reduce the sense of panic, minimizing the overwhelming nature of the project. The student starts to believe they can do this which is huge. Jamie: Honestly… I have no idea. Everything seems to be test, test, test and that concerns me. Like I mentioned earlier, I think education should be about trying to prepare our students for a future that is almost impossible to predict. That said, I think as long as we’re looking at each kid as an individual—vs. a cog in a system—and supporting our educators in a way that allows them to connect with the kids, so that they can become the best at whatever it is that they want to be, we’ll be in good shape. It’s that whole idea of “one kid at a time.” An environment in which my own kids are learning in and outside of the classroom is what I’ll be looking for as a parent. So by creating a tool like the Builder software, it is my hope that more students will be afforded the opportunity to do some deep research about a topic he or she finds interesting and meaningful. The idea being that they’ll actually be able to apply and use what it is that they’ve just learned. It’s exciting to think about the fact that I’m hopefully helping students learn how learn. Richard: I’m very optimistic, we tested the Builder in several types of schools, including the type of struggling inner city school that is full of at risk youth, gangs, and kids that might otherwise be written off. Now I don’t want to claim the Builder software is a ‘Magic Wand’, or a cure all for troubled classrooms, but working with the students during the class pilots, and watching how quickly they embraced the program, it was kind of like magic. I believe the right tools for the right job, combined with great educators could quickly move the United States educational system to a more student centered focus, which in my opinion is the right position. Victor: What else can you tell educators and other leaders in and around education about the value of mead builder research paper edition? What makes you say that? Jamie: If you made it all the way through this interview, thank you! We love talking about this kind of stuff and welcome any other questions. I’d also like to personally thank all of the educational professionals that are out there doing whatever they can to help kids – especially those who have and will continue to make the Builder software the best it can be. We appreciate all of the hard work and energy and hope to be able to assist you in your educational endeavors. Richard: Get the Builder software—you need it! Great interview, enjoyable mix of real-world education experience and learning in action from a couple of creative technology pioneers. Especially enjoyed that this felt less like a promotional piece and more like an expose of one cool solution leveraging sound theory and practical application. Thanks for this!